Big Red has been offering the G Pad 10.1 LTE since November of last year. 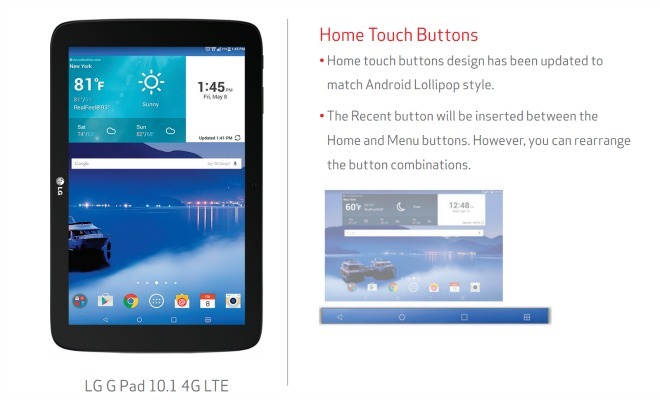 After applying the Lollipop update, the tablet will run Android 5.0.2 and software version VK70022A. The design of the software buttons has been updated to match the Material Design style of Lollipop, and a fourth button will show up on this occasion – the Recents button will be slotted in between the Home and Menu buttons. That said, LG stresses that you can in fact rearrange them if you want to. Notifications have made it to the lock screen, and the notification panel itself has been redesigned. Smart Lock is available, letting you add trusted devices that can automatically keep your tablet unlocked when they’re in proximity. The new Interruptions menu (which has since been modified by Google in subsequent Android releases) is in too, as is the Screen Pinning feature, Floating Action Buttons everywhere, and the ability to search through settings.